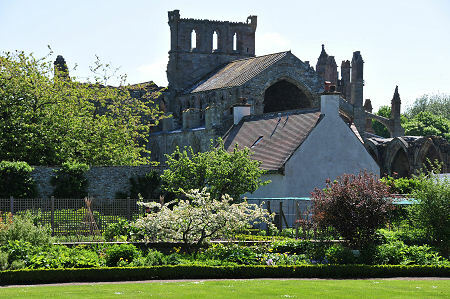 You can find Harmony Garden a little to the north west of Melrose Abbey, on the northern edge of Melrose itself. To reach it you cross Abbey Street from the abbey's visitor centre and follow it for a short distance, until it curves around to the left to form St Mary's Road. The gated entrance to Harmony Garden is set into the corner, on your left. Harmony Garden is the garden of Harmony House, and like the nearby Priorwood Garden is in the care of the National Trust for Scotland. 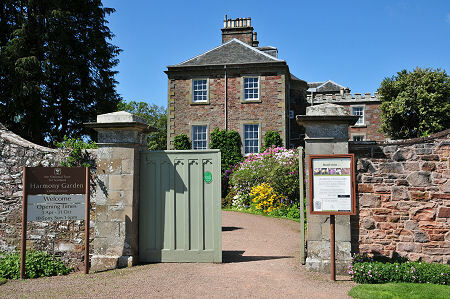 Harmony House is also owned by the NTS, but is not open to visitors. 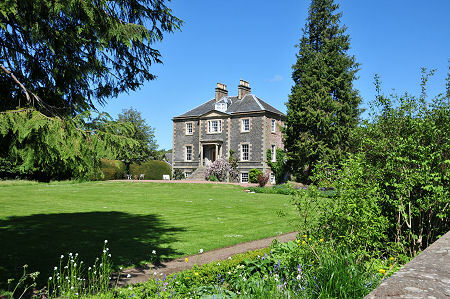 Instead it is let out on a self-catering basis to those who like the idea of staying in a stunning property on the edge of the the beautiful town of Melrose. It goes without saying that anyone staying at Harmony House also gets full benefit of Harmony Garden, though on a less exclusive basis than the house itself. Harmony Garden covers some 3.5 acres or 1.5 hectares and despite its semi-urban setting offers a remarkable sense of tranquility and remoteness. The high walls keep Melrose itself at bay, but the wider setting offers fine views across to Melrose Abbey, and to the slopes that rise above the north bank of the River Tweed. These are especially noticeable of the gorse is in bloom. The garden is divided into a number of distinct areas. Harmony House stands on the northern edge of the site, looking south into the garden. Between the east side of the house and the entrance gate are some truly spectacular gardens, strongly featuring rhododendrons, whose mass and height helped provide privacy for the house's early residents from anyone peering in through the gates. Immediately to the south of the house is a gravel turning area, screened on its western side by a fine (and finely trimmed) yew hedge. The area to the west of the house is given over to a sunken lawn that once offered facilities for bowls, tennis and badminton. The eastern third or so of the garden is home to the fruit and vegetable gardens. These extend from glasshouses and cold frames at the northern end to Harmony Cottage, near the south eastern corner of the garden. This part of the garden shows off a number of different traditional growing techniques and would originally have been used to provide the house with fruit, vegetables and cut flowers. 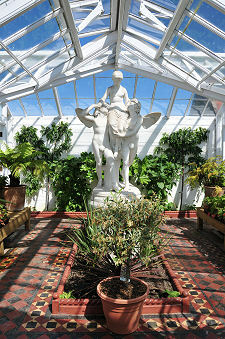 Visitors can look into the glasshouses, but access is not permitted. Management of the garden takes ecological considerations into account, with crop rotation used to help tackle pests and diseases. "Companion planting" is also used, with examples of pairs being grown together including strawberries and runner beans, and potatoes and horseradish. Produce of the garden is often on sale to visitors. We visited Harmony Garden in the height of summer. The lawn to the south of Harmony House is large: large enough to accommodate the Borders Book Fair each June. At the time of our visit it provided a pleasant frame for the house, but it really come into its own in spring, when thousands of bulbs make their presence known and the "bulb lawn" lives up to its name. The bulb-lawn is over a century old, and provides a home for dwarf narcissi, dog's tooth violets, crocuses and fritillaries. Not part of Harmony Garden, but immediately to its south is another area of garden and another set of greenhouses. Accessed from Abbey Street, and opposite the abbey, these are identified as being in the care of Historic Environment Scotland, but we have otherwise been unable to discover anything about them. They looked to be well cared for but largely undeveloped when we visited, though it is well worth looking into the main greenhouse for a view of the rather fine classical statue housed there. St Mary’s Road, Melrose, TD6 9LJ.